Wouldnt a regular fan controller work? I also have some voltage step down controllers, I can send you, see email. It seems this seller doesn't offer them anymore, but there are others on Ali-Express as well. So far I have received all of my stuff from Ali-express within the dead-line, except for my red / blue led beacons. Still waiting to see what's up with that. So... RGB LED strips... wired (plugged) into cheap-o Chinese inline LED controllers... that are wired to an LED-Wiz with ALL outputs fused... WTF? RGB led strips are already in my speakers holes, and they make a great 5 RGB flasher bar replacement....since I won't be using a traditional 5 flasher bar because I will putting in an addressable led-matrix where that normally is, and I still wanted something for Future Pinball compatibility....and it actually looks cool too. The cheap-o Chinese led amplifiers work perfect for how I'm using them and are needed for how many leds I may be driving on each LED-Wiz output. The LED-Wiz can't handle alot of leds on a single output all by itself. 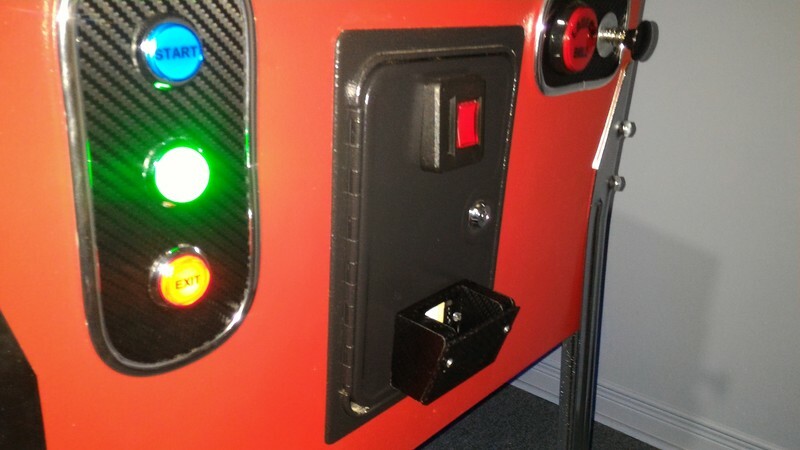 This isn't a MAME arcade control panel with single led rgb buttons that can be connected directly to an led-wiz or pac-led64 (which is how my start, launch, and fire buttons are connected). Having all outputs fused....even I'll admit, it may be a bit overkill for protection, but I had all the fuses and holder cables available and it was easy to connect. You never know where a piece of kit may be faulty, or where my wiring may have been wrong, etc... though so far, everything has been good. Actually, that's exactly what I have been using an LED-Wiz for. Controls my cab lighting, which is just RGB LED strips. Nothing against cheap-o Chinese goods. I love that ---steaming pile of meadow muffin---. It just seems highly unnecessary here. Fusing the grounds makes no sense. At all. I can understand not being a fan of Chinese stuff, but it works fine non-the less. I'm not exactly sure what my end state will be for how many leds per output I'll be using, so the amplifiers were more of a "just in case I installed more" down the line usage. Things may change up down the line... this is my first pinball or arcade cabinet, so I am learning and adding new things as I go. The fuses were more of a precaution in case of something in the "cheap Chinese" amplifiers going bad, or there's a short, etc, not to "protect the GND". I may not be an electronics engineer, but I have been an electronics tech for 20 years, and have repaired too much kit because of the lack of a fuse that may have helped because another part of the circuit went defective. Hey....I admit I don't have all the answers and I am learning more everyday in this build. I really was tempted to just wire everything straight up to the LED-Wiz....but when groovy game gear themselves use those "cheap chinese amplifiers" with their led-wiz / led strip setups (when I inquired about using these)..... I figured it wouldn't hurt to go that route. This is a mock-up someone did before installing all of this into their cabinet. 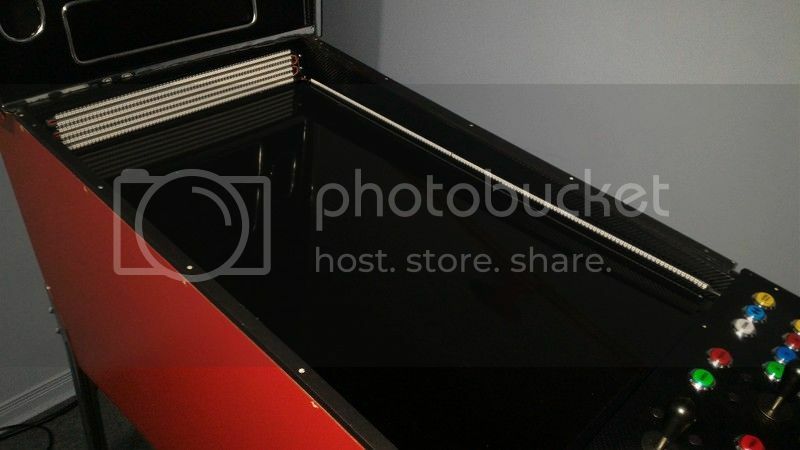 It is an excellent visual layout that really helps a noob to the virtual pinball scene. 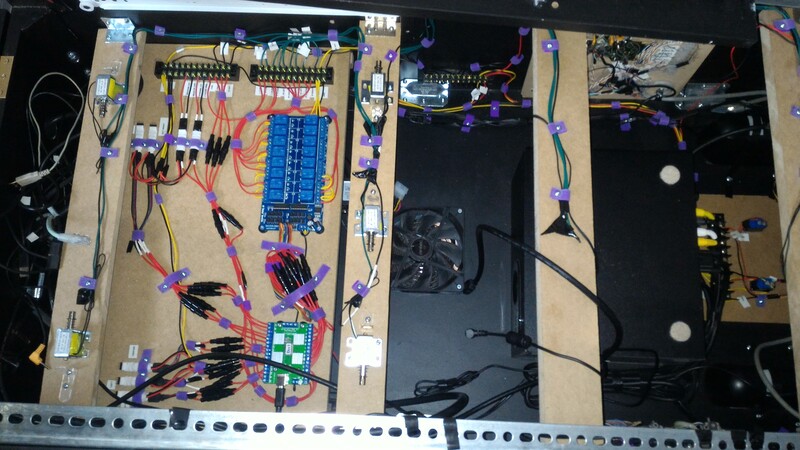 (like myself) Its most of the "feedback" that can go into a virtual pinball cabinet. 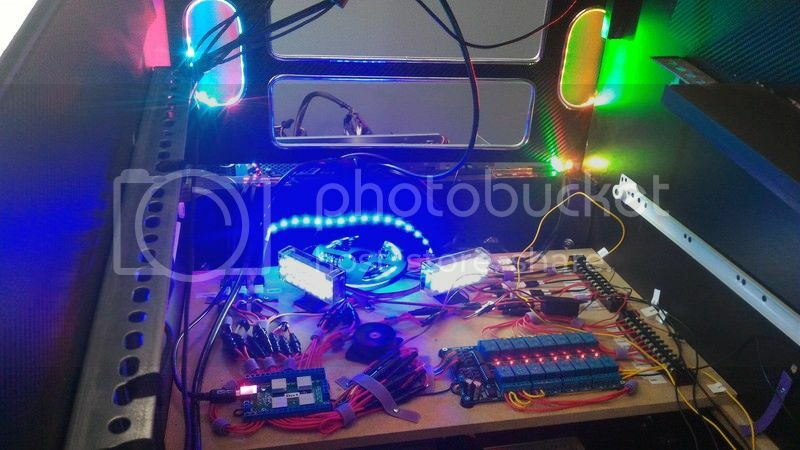 This pic includes your contactors / solenoids for your flippers / slingshots / bumpers / drop targets, etc..., 2 sets of 5 flasher rgb lights, led strip lighting for under cabinet lighting, strobe lights, knocker / chimes?, and power supplies (12V, and 24V?). Some other toys not in the pic can be beacon lights, shaker motor, gear motor, and blower fan. Great job on this mock-up pic. I'm not sure how I feel about that against cork. Does anyone know the flashpoint of cork? Totally understand what you are saying. The Led-Wiz manual does however recommend using an external power source to drive leds, and also to use fuses on the outputs of the LED-Wiz. I've also seen Zeb (Zebs Boards) and others who make driver boards also recommend fuses. You're not the only one who says that fuses aren't needed... but keep in mind that the LED-Wiz itself can also fail and cause issues AFTER the fuse. Hes saying fusing the grounds isnt needed. I understand and agree with him on that. However, the LED-Wiz itself "creates" a connection to the GND. The point of the fuse (if I'm correct) is to help protect the LED-wiz itself in case something attached to it does draw more than the LED-Wiz output was meant to handle. I'm not disagreeing with him, its just an extra protective step for the LED-wiz itself. Believe me, everytime I see that atrocious led-wiz / sainsmart board I created, I hate the way it looks.... but I don't care about that. All I cared about was having all bases covered, extra power for more leds if needed, protection for LED-Wiz just in case, and the terminal strips and led amplifiers allow me to be able to disconnect this board and remove it easily if needed, in case I need access to anything underneath it. I don't think you do fully understand what I'm saying. The use of an external power source is, in fact, needed in your application. However, those amplifiers are NOT a power source. What you have powering the amplifiers is the power source. So... amplifiers are not needed what so ever in your application. The LED Wiz manual does mention circuit protection via "an inline fuse". One fuse. Between the power supply and first component in the circuit. Be very careful about this kind of generalization. 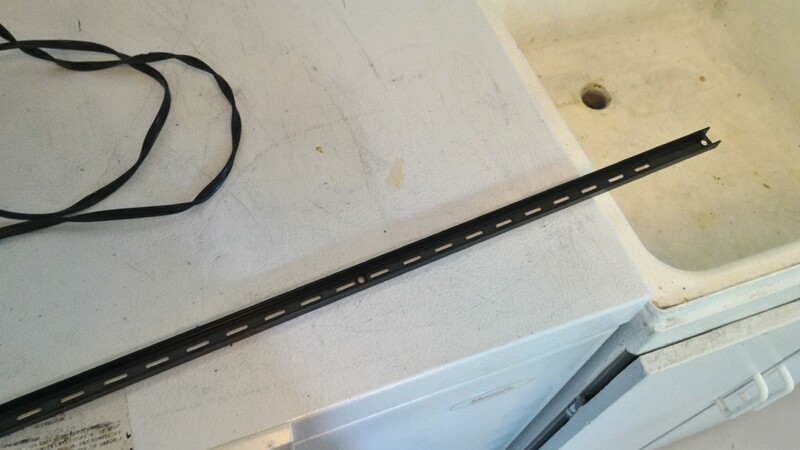 LED Strip requirements are measured in current, not in length. Some of these strips have 144 RGB LED's per meter! When lit white, just one meter would consume 144 x 3 x .020a, or about 8.64 amps! Even at 60 per meter, you are looking at 3.6 amps/meter at full on, or 9 amps for a 2.5 meter segment. This kind of current can cause a dramatic failure, and might even be a fire hazard! The use of those types of amplifiers is highly recommended for running RGB strips with any real quantity of RGB LEDs, or other high current loads. They are inexpensive, and also greatly reduce the load on the LED-Wiz driver chips, so that other, lower current devices can use the remaining outputs safely. In fact, many of the "booster" boards out there simply have nearly identical circuitry on the board, rather than being multiple discrete devices. The amplifiers are not the power source, but they allow the LED-Wiz to control much higher current loads. I.e. they take the output from the LED-Wiz, and deliver power from the supply, based on that output. Unless the lighting is static (always on) the amplifiers certainly are a necessary component. Grounds carry current as well, and over current is what blows fuses. When connected to the outputs of the LED-Wiz, they can protect the driver chips from damage due to short circuits and over current. There is no difference to the driver chip output, between a short circuit to +V and a device pulling a huge current load. Appropriate fuses protect against both. You're right... the reason why I'm using the amplifiers was for a power source for the led strips (fed from my 12V supply through the amplifier), and their 4 pin connection made it easy for me to be able to unplug them from where my led strips are coming from (speaker panel), and with what parts I have on hand. They were just also plug-in convenience. Where I live, we don't have stores that provide electronics parts, so I don't have access to something as simple as a terminal strip or cable ends on a whim. I have to order EVERYTHING online...and I'm not going to wait for weeks for a simple part if have something on hand that will work. So what you see is sometimes a result of what I had on hand to make it work. 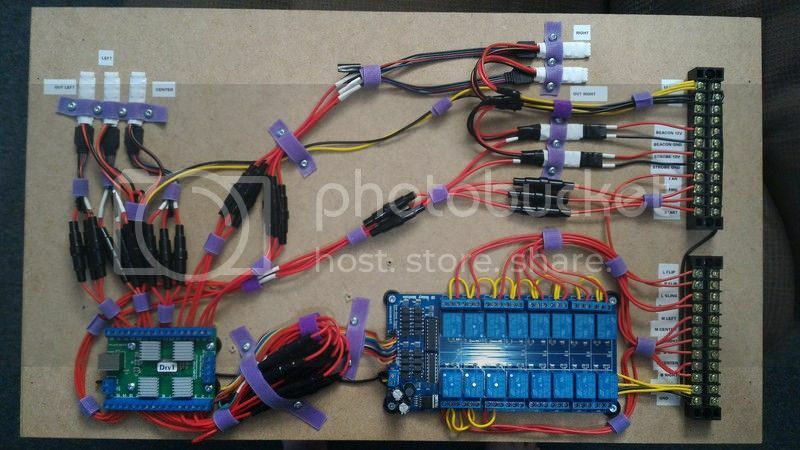 Hence my previous posts comment about making the led-wiz / led strip driver layout being a result of accommodating what limited wiring / parts I had available..... not the result of some great idea on my end. I guess the way I see it (and others), is that the Led-Wiz itself provides a connection from the fuse to GND through its own circuitry. That is not just a trace on a board to the GND. It passes through electronic components that have limitations of what can pass through it. The idea of fusing the outputs of the LED-Wiz is to "possibly" protect those components on the LED-Wiz. That is all I'm saying....its not something I magically came up. This is something that many "trusted" people have recommended and I went with it.... no harm done. The "Maybe its the 1000's of burnt circuit boards I've repaired over the years that has me paranoid..." comment was my (BAD) attempt at being humble. Thank-you for this response. It explains what my mind was thinking (when building this) much better than I'm able to express. I may change things up down the line, and my thought was to accommodate any changes that may come up down the line without having to change my board layout. Question... With RGB LED strips being extremely commonly controlled devices in the hobby today... Why not improve the LED-Wiz and incorporate this circuitry into your boards so your customers don't have to buy additional parts? Basically, so the unit doesn't end up costing $100+, when such high current is not needed by all users, and certainly not on all outputs. Better to keep it it modular, and allow end-users to add the amplifiers to only those outputs where high current control is desired, while still being able to control devices with lower current demands directly. Each installation is different in this regard, and this approach allows for scalable installations. 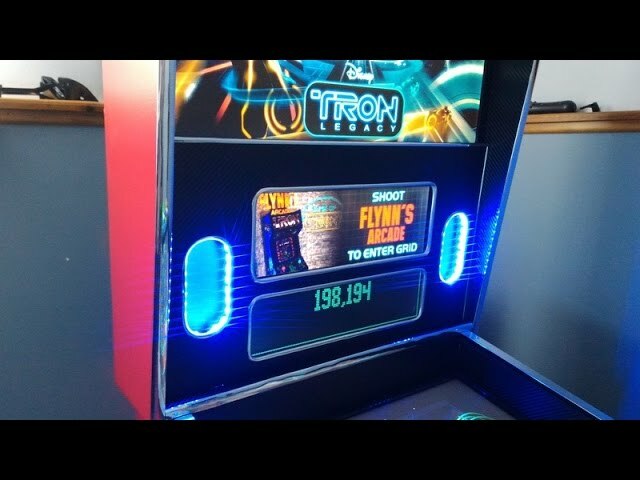 This was a big reason why I stuck with Led-Wiz for my Pinball / Arcade combo cabinet. 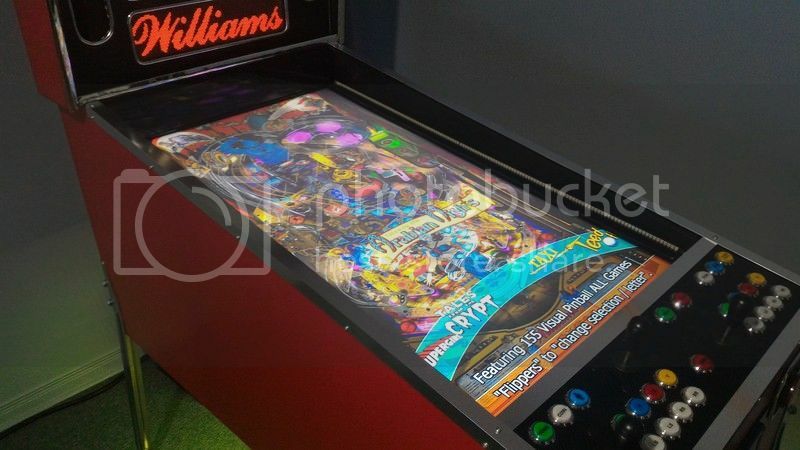 There were other excellent all in one (booster board, Pinscape, etc) solutions for virtual pinball cabinets, but Led-Wiz and Sainsmart combined with the cheap LED amplifiers really kept my costs down and made it very easy to setup. But in all seriousness. It's been what? 10 plus years since the LED-Wiz has been out? A LOT has changed since then. It'd be nice to see the popular parts used in projects get a little modernized. Change is good, Randy. It's important to note, that even the Chinese manufacturers take the same scalable approach with their LED controllers, which is why those amplifiers are even in existence. And they are inexpensive because they have dedicated factories, which crank them out by the millions. Even after 10 years, the LED-Wiz is still one of our best-selling items. So I have to believe it's doing what people want, and that is what is important to me. It's also a simple, proven and robust design, with proven industry-standard components which have withstood the test of time. I still have the same two units in my cabinet from the very first run, and they work as well 10 years later, as they did the first day they were installed. I have indeed considered a "high-power" version, but there are already several options out there for folks who need this. 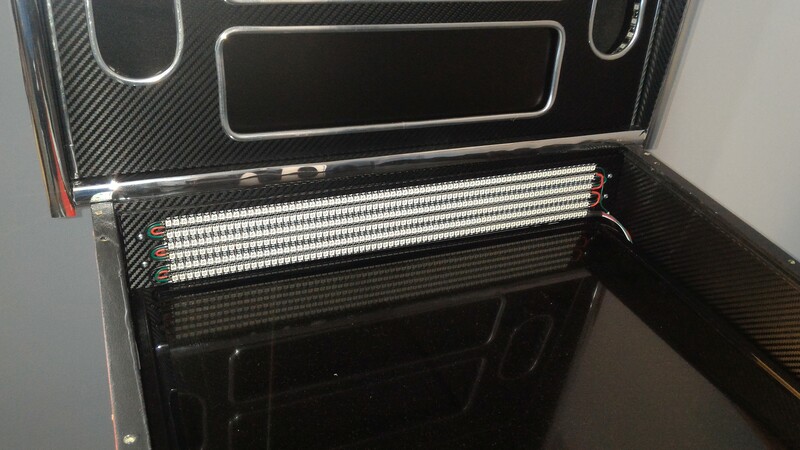 What we will likely do is offer the amplifiers as an option, with all of their connecting cables pre-attached and secured, to make them convenient and simple for users to install. I'm actually using an LED-Wiz with 4 of these little amplifiers regularly on my shuffleboard table. It's controlling 720 RGB leds, divided into 4, 3 meter strips. 99% of the time, it's full on (white) to provide illumination while playing. The rest of the LED-Wiz outputs are used directly to illuminate buttons for the custom scoreboard software I wrote. The entire setup is mounted to the inside wall of the case for the PC running it, and it has worked perfectly for over a year. People sometimes try to do some crazy stuff, and make mistakes. 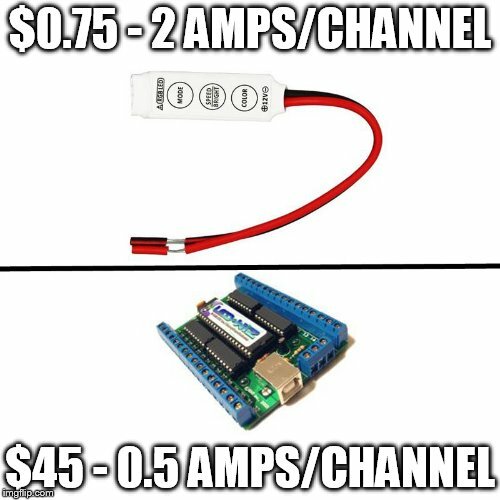 It just makes sense to be able to swap out an inexpensive amplifier when they let the smoke out, rather than disconnecting everything and have to pay to replace or service an expensive all-in-one board for one or two fried components. Thagerty's, and the other design are excellent examples of something which is scalable, reliable and easily serviceable. Kudos! Awww.... thanks Randy T. I'm glad to see the extra bit of soldering / kit is not going to waste. Since I have done alot of repairs of various different types of electronics kit over the years (consumer products, automotive systems, military land and aerospace comms), it changes how I look at things when building a project like this. You get to know what components tend to become defective, and how much of a pain it is to disassemble complex assemblies. Most of my cabinet is built with what resources / parts / kit I have available to me. Not because it's the best of the best. I always try to find the cheapest / easiest option. It may not be the prettiest layout inside, but it works with what I'm able to utilize, and it will need to be disassembled for moving, as anyone in the military can be posted anywhere / anytime. If I were to change anything, I would have made it so the computer and led / sainsmart trays would not have been the width of the entire cabinet, and could have slid out without having to unplug anything going up to the backbox. randr's cabinets are a great example. That being said, so far all the led lighting and solenoids are working great with the Led-Wiz and I couldn't be happier. Just waiting for my red / blue beacons to arrive (if ever). Now to figure out how / where to mount this atwood 3000 blower fan! Your approach to conducting business is baffling. If I had an LED controller used by many... And to find out people were using other hardware with it... Well I'd damn well sure want them to be buying this additional hardware from me, and have it available to those who want it, instead of making them sift through other hobbiests' posts on various forums trying to figure out how to use my hardware how they want. For several years you've taken a defensive stance when it comes to advice on better serving customers. Not saying you're doing a ---steaming pile of meadow muffin--- job. Saying there is always room for improvement. But keep them blinders on! Being ex-military myself, and having also dealt with some of these repair situations, I know exactly where you are coming from. Dealing with all-in-one custom electronics can be a nightmare, even if one has the skills to do the repairs themselves. Finding the parts which have failed, and coming up with suitable replacements for often unmarked components, usually dictates the need to simply replace the entire board, at substantial expense. It's why I find the modular approach to be better in the end. Heck, I even have an LED-Wiz running a pellet stove here in the shop on an old obsolete laptop. With the software I wrote, it actually works better than the $200 control board I would have needed to purchase. It's controlling a couple of large SSR's, and can be repaired in 10 minutes if something stops working. And that can be important when it's -20F outside, like it was when the original controller died on me . So now I finally have the solenoids all working. Unfortunately 1 of them was broken in shipping, so I had to settle for 9 instead of 10. Luckily DOF lets you easily combine cabinet toy functions through software, so I just combined middle center and rear center. I decided to mount them on cross pieces since I was running out of room on the sides of the cabinet. This also allowed me to position them closer to where they would typically be in a real pinball cabinet. I also didn't like the very loud "metal smacking wood" sound the solenoids give when fully engaging (they would also sometimes get stuck open for 2 seconds). So I used some "plexiglass / plastic" L-bracket looking pieces I had lying around for the solenoids to strike. This kept them from getting stuck and it sounded much better. I also used cable clamps for the slingshot solenoids which works really well to replicate that type of sound. Sadly, I ran out of terminal strips, so I settled on using solder and electrical tape for the diodes connected to each solenoid. (to snuff out any EMI that could damage the Sainsmart relay board) That's why my wiring looks so wierd for some of this....and the lack of sleep from cleaning my house for 4 days straight didn't help either. Even more progress...let there be light! Now my 5 flasher LED strips, strobes, start, launch, FIRE button lights are all working with both VP and FP. My beacons are wired and ready…just waiting for them to arrive in the mail! Now its on to getting my blower fan working. My blower fan (attwood 3000) works, but I gotta figure out where its going to go! Gotta find a way to convert a 3 inch hose to the coin door hole opening (similar to what randr did). Otherwise it will have to go on top of the backbox. Once the fan is done and the beacons arrive…. then I’ll make a topper to finish it off! After seeing blower fans on other pinball cabinets, I knew I was going to have one in my cabinet. Some people have a simple fan on top of their cabinet. 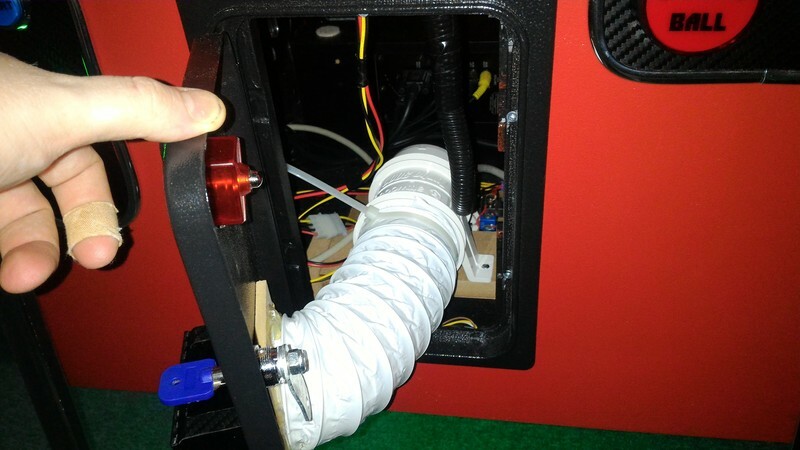 Others use an inline blower fan. Since alot of the events are quick bursts of air, you need something that can push alot of air very quickly to get the right effect. I used an Attwood 3000 inline blower fan. Since I'm just using this with my relay board for simple on/off function, this works nicely. Its very effective but also very loud when not used with a hose. When I tried it on top of my backglass, I found it to be too loud, and the air was being spread to wide and alot of the effect was lost for those quick bursts (an Attwood 4000 would work better on top). I really hope I can find something that will work better.... any suggestions? Well here it finally is.... addressable LEDS! After seeing randr showing off addressable leds in action in his cabinet, I knew I would eventually want it! Well here we go! 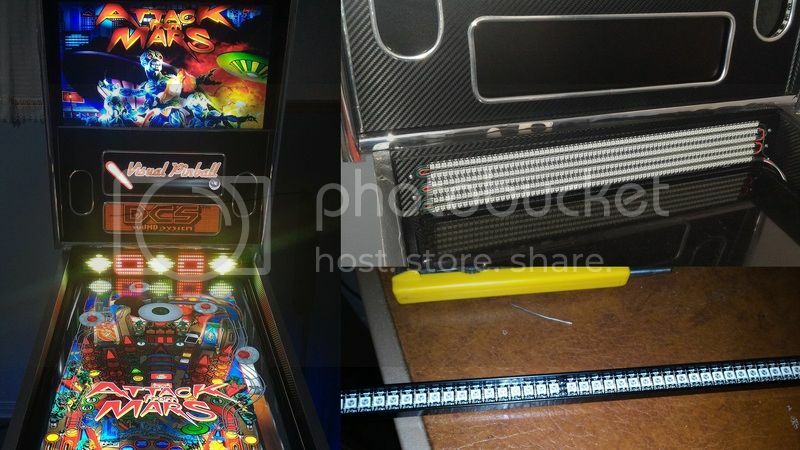 For my cabinet, my playfield TV lays down on rails, so I couldn't just stick the led strips on the inside of the cabinet, as they may get in the way if I ever need to remove the TV. So I needed to have them mounted on something. You can buy proper aluminum channels, but to order them online was quite costly with crappy CDN dollar and shipping. So I decided to use these shelf rail things I found. They are normally mounted on a wall with the opening facing the wall so you can install shelf supports in the slots. They were cheap and they were black so they matched my cabinet inside perfectly. I just had to put in some long strips of backboard for the leds to stick on, or they would be in too deep and it would be hard to see them while playing. The led strips I purchased are 144 per meter. I have over 700 leds installed. Thats alot of leds! As a result I had to use a dedicated 5V power supply rated at 60A! 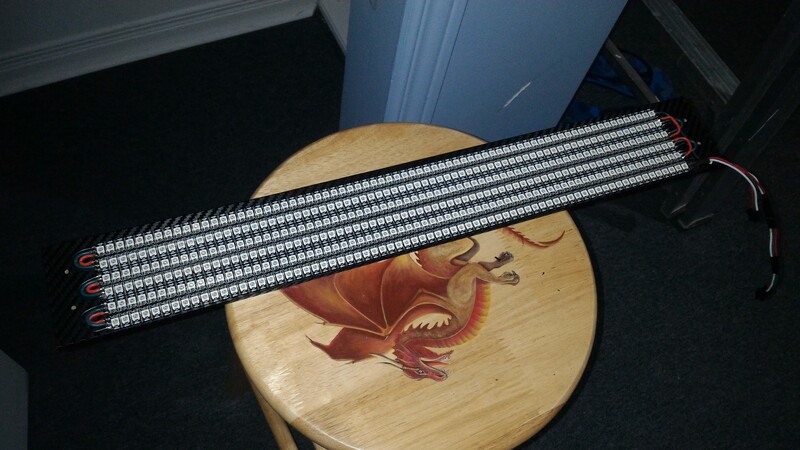 No matter what length of 144 / meter strip you buy, they all come with 0.5 meter strips soldered together. 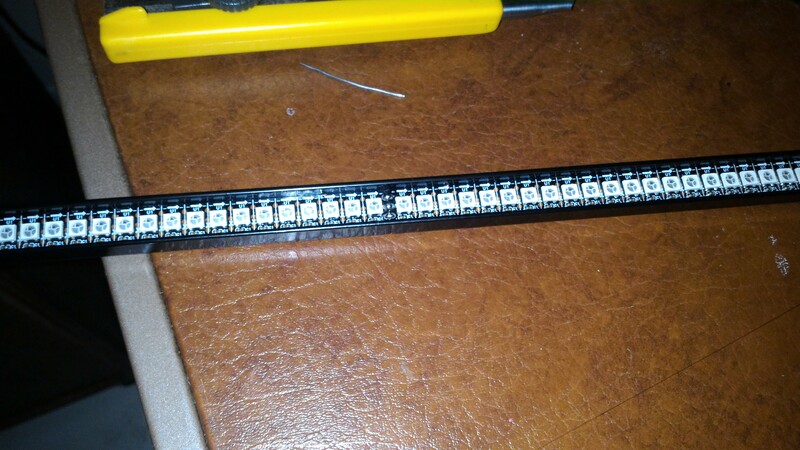 So if you want a seamless looking strip, you'll need to cut off an led or two and solder it back together. Since my work's soldering station just died, I was stuck with my crappy 21 year soldering iron. For the side led strips I wasn't worried about cutting them to make them look seamless. 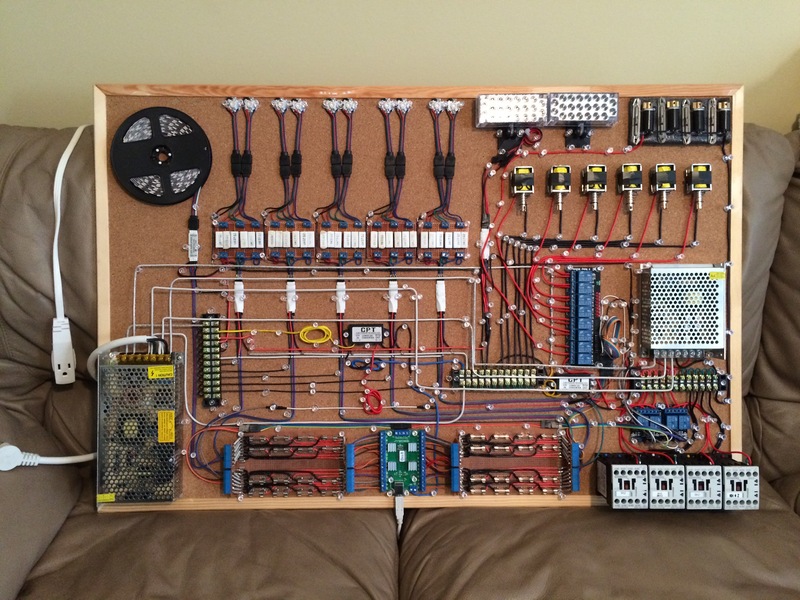 Here is the matrix I made for the back of the playfield. This will look like a low-res led screen. It can be made up of how ever many led strips you want as the DOF software will just scale to whatever you have. I used my 2 meter strips and their middle 0.5 meter sections for the back matrix, as they were the perfect size without me having to cut any strips and resolder them to size. I did however have to solder the 5V, data and gnd pins to and from each strip. ...and here it is in the back of the cabinet. The connections start at the Teensy controller which is plugged into the computer via usb. Then the Teensy has a cat5 cable output that uses 2 of its wires for the GND and DATA line going to the first strip...which is the right playfield strip. The DATA line then gets connected to and from each strip / matrix, for a continuos connection. 5V and GND also needs to be tapped in at the begginning of each strip and the matrix, as there are alot of leds that need power. These LEDS are REALLY bright on max brightness. To cut down on that and also to make it so you can't even see the led strips when they are off.... I had a custom piece of tinted plex-glass (5mm) made for the back matrix. That alone wasn't enough, so I needed to add window tint to the front of the plex-glass. I put on 20% tint. This combined with the plex-glass tint was perfect and hid the leds completely until they light up. Now I want to do the same for the sides, but I don't know if I can get plexi-glass cut that small and long. Success! After setting up the DOF software, the leds strips look amazing! It's hard to describe all the effects they do while playing, but here is a picture showing the back matrix displaying animations while browsing in Pinball X. ....and here is a video describing what the setup is, and showing what is looks like in Pinball X! I'll make another video that will show some gameplay that shows off the cool effects while playing! See, this matrix you made is cool and interests me. I'd love to see a thread just on this part alone in more detail. Great job! When can we order a ledwiz alternative from you? I have a pile of LED controllers laying on my soldering table that I intended on selling along with NephRings. I shifted my business from a global focus to a local one two years ago, and I'm glad I did. Since i'm still fairly new to the scene here.... help me out. What's your business based on Nephasth? ....and what are NephRings? NephRings were a joystick lighting option I invented (as far as I know). I did a couple manufacturing runs to sell to members here. It was a lot of work for little pay. There was plenty of reward in helping others out with their builds, but I was putting too much time into it. Ended up giving the files to Paradise Arcade Shop. Unfortunately, they never made them available. Other members here have since come up with various DIY ways to replicate the effect NephRings give. Which is cool, that's what this site is all about, DIY. Shortly after all that I started up an LLC. First phase of my business was to operate coin op dart boards at bars around town. My league has been growing consistently, and currently in its 6th season (2 years). I just paid all my dart boards off (around a $25k investment) a couple weeks ago. With them paid off and generating a steady and reliable income (which requires almost no work on my part), phase two will kick off relatively soon. But I can't talk about phase two... yet. My business is just a side business for now. I'm a full time pipeline technician, but the goal is to grow the business enough to quit working for "the man." That sounds great.... I love seeing people able to succeed from hard work! While I certainly intended to get another video that showed off the addressable led matrix in action..... I got distracted by a couple of things. First...I updated to the newest VPX, and the newest UltraDMD. Then I realised that I had been missing out on a bunch of VPX tables that came out in the last few months! Pinball FX2 and The Pinball Arcade now have DOF feedback for flipper solenoids (NOT slingshots or bumpers! ), RGB lighting and more thanks to a new program called DOFFX2. It basically maps keyboard keys to trigger Led-Wiz or sainsmart outputs! It also has some other cool features like RGB lighting control, flipper solenoid timers, and more. 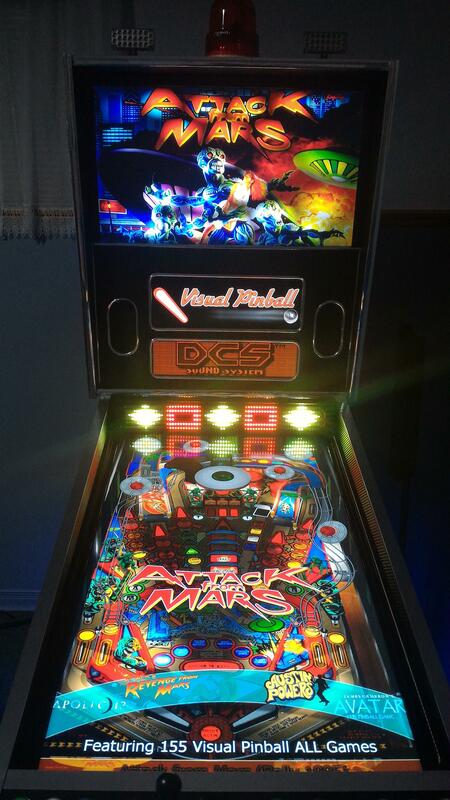 Here are videos that demo both Pinball FX2 and The Pinball Arcade on my cabinet running with DOFFX2 (1.3 beta). I have the program set to be always on and active the whole time, and you can see it doesn't interfere with Pinball X running the DOF plug-in. I have the flipper buttons triggering my solenoids. I have the center RGB led strip "flasher" set to random flipper triggered RGB lighting. I have the flippers set to turn on a left flasher as green, and a right flasher as blue. I have the beacon, blower fan, and strobes set to go off during certain moments.... including an appearance from Scotty of Star trek! Very nice, where's the tutorial for addressable led matrix setup, that's pretty sharp. 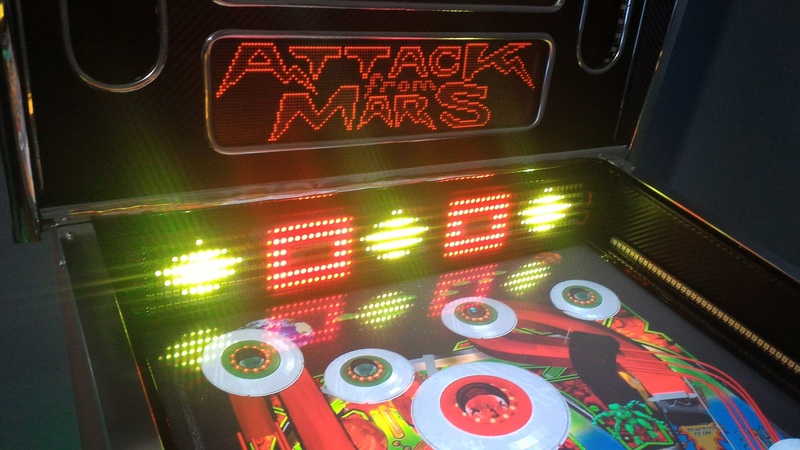 Also did you use a 16 relay board instead of 8 and does the addressable led matrix work with Pinball X? Page created in 0.298 seconds with 62 queries.